Consider Japan, a nation with a population of over 120 million, the second most powerful economy on earth and a long record of highly civilized achievement. Then contrast it with Libya, a desert country of under three million persons, few of them skilled in modern ways or terribly cultured. By every conceivable measure, the Japanese so outperform the Libyans that comparison between them seems a little absurd. Yet in one vital way Libya tops Japan: in world-wide clout. Libya takes part more actively in international affairs and its policies count more than do Japan's. Look at events of the past few years. Both countries' prosperity depends on international trade, yet the Japanese have to struggle to keep markets open while Libyan oil is everywhere welcome. Although economic aid from the two countries is about equal, Libya ties it far more tightly to political ends; witness the rash of African countries that broke diplomatic relations with Israel in 1973 on the strength of Libyan promises. Japan's armed forces are large, modern and well-trained, but they've had virtually no role in international affairs since World War II. Libya's much weaker military has fought repeatedly: within the past four years, against Egypt and Tunisia, as well as in civil wars in Uganda, Central Africa and Chad. Additionally, Libya serves as a major arsenal for Soviet weapons destined for use in the Mediterranean, the Middle East or Africa. Japanese culture arouses admiration, around the world, yet netsuke, jujitsu and sophisticated art films have virtually no political import. In contrast, the Libyan government uses the Arabic language and Islamic religion as instruments of foreign policy. For instance, it pressured the Maltese to teach Arabic to high school students and cemented alliances with two African leaders (Bokassa of Central Africa, Bongo of Gabon) by winning them to Islam. Japan has no ideology or cause to spread; its citizens and government seem more inclined to savor their wealth than to exploit its potential influence. The Libyans, however, extract maximum political benefit from each barrel of oil. As a result, Libya has become a significant force in world politics. Virtually a forgotten country a decade ago, it today commands newspaper headlines and keeps the midnight lights burning in foreign ministries around the world. 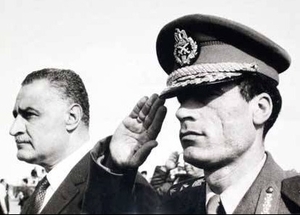 Qaddafi (R) with his mentor, Gamal Abdel Nasser, in 1969.
Credit for this goes to Colonel Mu'ammar al-Qaddafi, whose revolutionary government took power in late 1969. Using novel methods, he has transformed a primitive country with meager human resources into an important actor on the world stage. Careful use of oil revenues combined with fiery determination and imaginative recklessness have allowed Libya to act in dozens of countries. During his tenure, the Libyan government has encouraged coup attempts in six Arab countries; it has supported Moslem rebels in the Philippines, Thailand, Afghanistan, Ethiopia and Chad; aided extremist Moslem groups in Indonesia, Malaysia, Turkey, Egypt, Saudi Arabia and Nigeria; helped the Polisario against Morocco, the PLO against Israel, Khomeini's forces against the shah, the national Front against the Maronite Christians in Lebanon and about eight separatist movements against established governments in Western Europe. Qaddafi's forces came to the rescue of regimes such as Idi Amin's in Uganda, Bokassa's in Central Africa and Nguemo's in Equatorial Guinea. His backing was essential for some of the most spectacular terrorist operations in recent years. Numerous attempts by Qaddafi to enlarge his home base through union with other countries all failed when each of his seven prospective partners realized that he intended to dominate the merged government. Chad may actually unity with Libya, however, for in this case Qaddafi made sure to take control of the country beforehand. Libya also wields clout in many international organizations. Qaddafi projects influence in more unusual ways too: He offered bribes to Billy Carter, wrote tracts of political philosophy (which recipients of his aid are pressured to follow) and one time locked up North and South Yemeni negotiators until they reached a settlement. Procuring nuclear weapons has increasingly become a top priority in recent years. It began when Qaddafi helped to finance Pakistani molecular research in 1973; then his forces stole uranate from trucks in Niger and annexed a uranium-rich region of Chad. Today, Argentina trains Libyan, technicians in uranium extraction. The list of activities goes on and on, ranging to Sri Lanka, the Caribbean and even the South Sea islands. Sheer volume of activity makes Libya a force to reckon with. And in addition to direct political moves, Qaddafi also has vast financial power. He can pressure countries by promising to sign commercial contracts or employ their workers; conversely, he can threaten to cut off oil sales or terminate aid programs. Libya today represents a new phenomenon – what may be called a global mini-state. Despite a small and unskilled populace, one incapable of generating its own wealth, culture or military punch, Qaddafi has acquired an influence which he extends to all regions of the world. His own initiative plays a major role in this; but the foundation of Libyan power is oil revenues. In 1981, oil revenues to the government should exceed $25 billion. Thanks to the forbearance of the great powers, Libyans can do whatever they please with this wealth. One may view this forbearance as admirable or cowardly; in either case, the anomaly of Libya's influence and standing deserves notice. How much longer, one wonders, will Colonel Qaddafi be permitted to wield his unlikely power without check? Mr. Pipes is the author of Slave Soldiers and Islam, just published by Yale University Press. Oct. 20, 2011 update: In answer to the question concluding the above article: Qaddafi was permitted to rule tyrannically another 30 years, eight months, and one day, when he was overthrown not by external forces but by his own aggrieved subjects.